Send your Formidable entry data to any other site that has a REST API. This includes the option of sending entries from a Formidable form on one site to a Formidable form on another. The view routes require WordPress v4.7+. In your WordPress admin, go to 'Formidable' → 'Add-Ons' and click the 'Install' button for the Formidable form API plugin. To find the API key, go to your 'Formidable' → 'Global Settings' and click the 'API' tab. Make a GET request to retrieve data. GET requests will never cause an update or change to your data because they’re safe and idempotent. Use a POST request to create new entries, forms, or fields. POST can also be used to update an entry, form, View, or field. Make a PATCH or PUT request to update an entry, form, or field. With PATCH and PUT requests, you only need to provide the data you want to change. Make a DELETE request to delete an entry, form, or field. yoursite.com/wp-json/frm/v2/entries GET Get entries from all forms. yoursite.com/wp-json/frm/v2/entries POST Create an entry. yoursite.com/wp-json/frm/v2/entries/# GET Get entry by id. # = entry ID. yoursite.com/wp-json/frm/v2/entries/# POST/PUT/PATCH Update entry by id. # = entry ID. yoursite.com/wp-json/frm/v2/entries/# DELETE Delete entry by id. # = entry ID. yoursite.com/wp-json/frm/v2/forms/#/entries GET Get all entries in a form. # = form ID. yoursite.com/wp-json/frm/v2/forms/#/fields GET Get an array fields from a form. # = form ID. yoursite.com/wp-json/frm/v2/forms/#/fields POST Create a field in a form. # = form ID. yoursite.com/wp-json/frm/v2/forms/#/fields/# GET Get a field from a form. The first # is the form ID, and the second is the field ID. yoursite.com/wp-json/frm/v2/forms/#/fields/# DELETE Delete a field from a form. The first # is the form ID, and the second is the field ID. yoursite.com/wp-json/frm/v2/forms/# GET Get a single form. # = form ID. yoursite.com/wp-json/frm/v2/forms/# DELETE Permanently delete a form. # = form ID. If you would like to send entry data to another site when an entry is created, updated, or deleted, follow the instructions below. From your WordPress dashboard, pull up the form that you would like to send data from. Go to the 'Settings' → 'Form Actions' tab. Click the 'Send API data' icon to add a new API action. Insert the Notification URL for the site that you would like to send data to. Insert the Handshake key, if required, of the service that you are sending the data to. Insert the data that you would like to send in the format that the receive application is expecting. Choose when you would like this hook to fire. Make sure you are NOT using default permalinks on your WordPress "Settings" -> "Permalinks" page. Save your new action and either create, update, or delete an entry to trigger it. You can send a form entry to Zapier, using the API add-on, when an entry is created, updated, deleted, imported, or saved as a draft. If you only need to send entry data to Zapier when an entry is created or deleted, and you want a faster setup, you can install our Zapier add-on. Follow the steps below to send entry data to Zapier. Go to zapier.com and log in to your Zapier account. Select 'Webhooks by Zapier' as the Trigger App. Select 'Catch Hook' and continue. Leave the 'Pick off a child key' option blank and continue. Zapier will now provide you with a unique URL. Copy it to your clipboard. Click 'OK, I did this'. Go to your site's dashboard. Create a new form or go into edit an existing form. Go into Settings > Form Actions. Add an API action. Paste the URL from your clipboard in the Notification URL box. Put API-KEY-HERE:x in the Basic Auth box. Replace API-KEY-HERE with the API key. Set up a few key value pairs. You may use any text you would like for the name. You may insert field ID shortcodes, static text, or other shortcodes for the value. Configure your 'Trigger Actions' as needed. Submit a new entry in your form. Go back to zapier.com. Zapier should say 'Test Successful!'. If it does not, please create a ticket in the help desk with the message that you are seeing. If you do see the success message, hit Continue and finish setting up your zap like normal. Follow the steps below to create a new entry in a Formidable form with Zapier. Create a new Zap in the Zapier dashboard. Select and configure your trigger. Select "Web Hook" and then POST for the action. Go through each step as instructed by Zapier until you get to #5 "Match up Trigger to Web Hook POST." Data: Add a row here for each field in your form you'd like to populate. Be sure to include your form_id here as well. For now, use the field keys instead of field ids in the left column. Replace "API-KEY-HERE" with your API key from the Formidable -> Global settings -> API page. Save your settings, and test out your Zap. If you would like to update an entry on the same site or a different site with the API add-on, follow the steps below. Please note that Formidable and the API add-on must be installed on both sites. Go into edit the form that will send the data and trigger the entry update. Click on 'Settings' → 'Form Actions' → 'Send API Data'. This will add an API action to your form. Replace x with the ID of the View and replace y with the ID of the userID field in your current form. This would update the first entry created by the current user. Note: This will only work if you are updating an entry on the same site, but not if you are updating an entry on another site. Insert the API key of the receiving site in the Basic Auth box. Make sure to use the receiving field key in the "Key" column. Use the sending field key or ID in the "Values" column. Select 'PATCH' as the Method. This will ensure that only the posted fields are updated. That's it! Now try submitting an entry in the sending form and see if it updates the entry in the receiving form. Note: If you are sending along date field values, make sure that you use [x format="Y-m-d"] in the shortcode. If you are using user registration in a form on the receiving end of an API call, a couple of extra parameters are required. This tells Formidable which fields should be used for registration. If you have a password field in the form and are editing an entry with an API call, this will prevent required errors for that password. Change 25, 26, and 27 to the IDs of the fields in the receiving form. This should match up with your registration settings in the form the API call is being sent to. These are literal ids and not values from the form. Then go the the registration settings on the receiving site and check the box to "Allow logged-in users to create new users with this form." Follow the instructions below to automatically create an entry in a Formidable Form in another form or on another site when an entry is created in a Formidable Form. Please note that you must have current versions of WordPress, Formidable, and the Formidable API add-on installed on both sites. Go into edit the form where entries will be submitted. Go to "Settings" → "Form Actions" and click the "Send API Data" icon to add an API action. Make sure you replace https://site-to-send-to.com with the actual URL of the site you are sending data to, or use [siteurl] if you are creating the entry on the same site. Replace 12 with the ID of the form that you are sending data to. Select 'POST' as the Method. That's it! Now try submitting an entry in the sending form and see if it creates an entry in the receiving form. Change 727 to the address field ID in the receiving form and 25 to the address field ID in the sending form. Instead of using the JSON format option, select 'raw'. field1 & field2 = Field keys in the receiving form. Use field ids or keys. 270 & 271 = Field keys in the sending form. Use field ids or keys. 32 = The id of the repeating child form. This value is tricky to find. As of Formidable v3.0, this is not needed. 279 = The id of the repeating section in the sending form. Use the field id or key. 300 & 301 = The field IDs of fields inside the repeating section in the receiving form. Use field ids. 280 & 281 = Field ids inside the repeating section in the sending form. Use field ids or keys. When you use the yoursite.com/wp-json/frm/v2/entries/25 route via GET, extra parameters are available. page - The page number to retrieve. Defaults to page 1.
search - Search all fields in the entries for a value. No default. If you are sending the API request from one WordPress site to another, you can use wp_remote_post or wp_remote_get. If you have created a Formidable form or View on WordPress site #1 and you would like to publish it on WordPress site #2, you may use the frm-api shortcode. id: The ID of your form or View that you would like to display. type: Use type="form" to retrieve a form and use type="view" to retrieve a View. url: The URL of your site that holds the view/form you would like to embed. get: Need to pass dynamic data from your url to the site holding the data? Include the names of any parameters in your url to pass. For example, if your url includes ?house=321&street=Lane and you want to pass 321 and street to the other site, include get="house,street" in your shortcode. Usage: get="anything,in,url"
If you have created a Formidable form on WordPress site #1 and you would like to publish it on WordPress site #2, follow the directions below. This is helpful if you would like to store all entries on site #1. Make sure you are running the current versions of WordPress, Formidable, the Formidable API add-on on both sites. Go into edit your form (from site #1). In the Settings, check the option to 'Submit with Ajax'. Make sure the form is not limited to logged-in users. When publishing a form with the frm-api shortcode, all users (whether logged-in or out) will see what a logged-out user would see. Replace 200 with the ID of the form that you would like to display and replace http://example.com with the URL of site #1. If you have created a Formidable View on WordPress site #1 and you would like to publish it on WordPress site #2, follow the directions below. If your View is a Dynamic or Calendar View, you will need to go into edit your View and replace the detaillink shortcode with ?entry=[id]. Make sure your View is public so it will be visible on site #2. The frm-api shortcode does not use authentication, meaning that it will display what a logged-out user would see on site #1. Replace 200 with the ID of the View that you would like to display and replace http://example.com with the URL of site #1. This script will pull a form or View from a WordPress site and allow you to display it on a non-WordPress site. You'll need to add the script and HTML to your non-WordPress page. You'll also need to change the text marked in red. This script depends on jQuery, so be sure to load that on your page as well. Read more about loading jQuery on your site. When using the version 2 API, you can easily insert forms and views on your page from another site. You can even search those inserted views. Install Formidable and this API plugin on both sites. Create a search form on the site that is embedding the view. The redirect url for the search form will include whatever parameters your view is setup to filter by. Or you can insert the basic search form with the [frm-search] shortcode. See more detail on the frm-api shortcode above. Use the yoursite.com/wp-json/frm/v2/forms/25 route via POST to create a form. fields - an array of the fields to create in the form. See "Create fields in a form" below. fields - an array of the fields to create in the form. Each item in the array can include field settings. type - Required. No default. name - Defaults to field type name. description - The optional field description. required - Defaults to not required. field_order - Defaults to next field. field_key - Autogenerated by default. options - An array of choices for a radio, dropdown, or radio field. Defaults to blank. In addition to sending API calls to the Formidable API, the API form action can be used to send REST API calls to other APIs. This includes sending a request to the WordPress API. 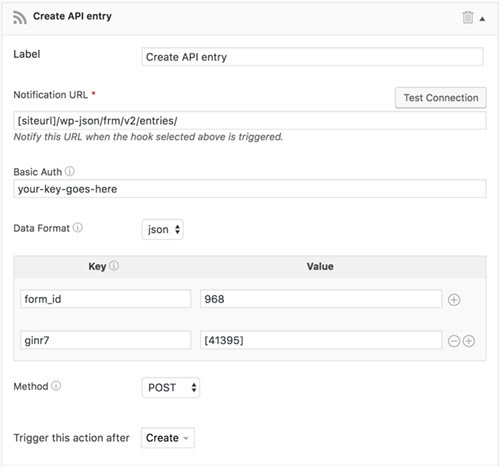 The API can be used by logged in users to trigger API calls on the same WordPress site. If there is a reason to use the API instead of the regular post creation, follow these steps. Go to the form settings page for your form and add a 'Send API data' form action. The Basic Auth box can be left empty when sending a request on the same site while logged in. Submit your form, and the post will be created. Check the response from the webhook, and add a message to the success message shown after your entry is submitted. This is based on the status the API call returns. After an API request is sent, a response is often returned. Use this example to save that response into a field in the entry. You must include a default value in this field (like 0) so it can be updated. Use the following code to customize the headers sent with your API request. Visit yoursite.com/wp-json/ to check that the WordPress API is functional and accessible. You should see a page of text when visiting this url on your site. If you see the page of text, continue to the Postman test below. If you are redirected to a login page, the plugin/code forcing the login redirect is blocking access to the API. The offending plugin will need to be deactivated. If you see the home page, there are two possible explanations: pretty permalinks have not been turned on in your WordPress settings, or there is a plugin conflicting. Once you are able to see the text page, then test your form again. If the API call still fails, continue to the Postman test below. Postman is one of the most helpful tools for troubleshooting and testing APIs that we have seen. Start by downloading it and running your test through their interface. If you get a 403 response with a Postman test, follow the Basic Authentication instructions below. If the test is successful and returns the correct result, continue to logging below. The hardest part of sending API calls with a form action, is that it's difficult to see what is happening. If an API call isn't successful, install the Logging plugin and follow the instructions on that page. This will tell you when an API call is firing, where it is going, and the response. The 'frm_message' section in the logs includes the simplified response to help you make adjustments to the settings for the API call. If you don't have a Business license package or higher, download it from Github. The Formidable API uses Basic Authentication. Some servers do not have Basic Authentication enabled by default. In these cases, you will get a 403 response along with an error message like: "Sorry, you are not allowed to [create,update,delete] entries." Please see more troubleshooting steps for setting up and verifying Basic Authentication. The errors shown when a test connection is tried are not a true indication. The test connection link you see only tells you if that link is reachable in many cases. Depending on the API you are sending to, it will not return a successful response when the data is not included. Try a true test by submitting the form. If you still have trouble after that, continue to the troubleshooting steps. If you get a 409 response in your log entry, then you have fields that are missing values. This will cause the entry to not be created. Please follow the steps below to resolve the issue. In your API form action, add values for those missing fields. Turn off confirmation fields in your receiving form, if any. You can use the Logs add-on to see the error messages that show the validation messages.